Child´s underwear 100% made in Spain. They don´t stand still, the world is a huge game room and each second counts. Our collections follow their rhythm, giving them complete freedom as we take care of their skin, even when they sleep. Here you can find short and long sleeve as well as sleeveless, mid length sleeve t-shirts and much more. Find the most comfortable underwear for your kids from our large collection that we present you with! Comfort for every day, for any style and any occasion. Children´s internal thermal long sleeve t-shirt with round collar.Interlock napped.Winter t-shirt.Rapife 100% made in Spain. 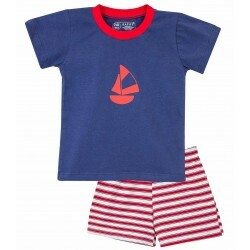 Child´s Summer Pajamas.Available in two colors.100% Cotton.Rapife 100% made in Spain. Child´s unisex summer pajamas.Available in two colors.100% Cotton.Rapife 100% made in Spain. Children´s unisex pajamas with print.Article reduced 50% only while supplies last.100% Cotton.Rapife 100% made in Spain. Children´s pajamas with detailed embroidery.100% Cotton.Rapife 100% made in Spain.